Thank you. I hope OP is updated with this. I wonder if Mario Tennis is doing ehh because there's so little content in the game. Feels like the game needed another 6-9 months. Overpriced and under-featured. Not sure the sales for it are disappointing though. It appears to be doing well in most every region. What charts are you reading ? It is doing good to great in all regions. This new entry is destroying past entries sales wise, the game is performing really well across all European countries. ...Well yeah, as the other already said, i don't get what you mean. The game is performing absolutely good, in literally every countries, we just need to know America numbers. am I reading it right that Mario+ Rabbids is below dkc:tf in the all formats chart, but above it in the individual formats one?? That would mean there’s a surprisingly significant (relatively) amount of people still buying it on Wii u lol. You been trolling sales-era for quite a bit these days...lol stahp. They’re heading in the direction. We’re still far away from the incredible Wii/DS years in terms of software sales, but I think it will get there with Smash and Pokemon double impact. That end of the chart could be less than 1k total, so it's possible. I will have whatever you're having. Nice performance for Wolfie II on Switch in Spain. Seems like the late port might not have been that bad an idea. But yeah. Octopath getting #1 is unlikely. Anything over 10k is a decent result imo. Can't wait for charts with digital sales. retail only charts feel so incomplete now considering how digital has grown. In the same timeperiod Until Dawn already had dropped to 24th place on individual units and 29th all formats. Heavy Rain was down to 19th and 23rd respectively. Very nice. Yes I’m very impressed with its hold and I believe it’s still full price. Deserved too. I’d be surprised and disappointed if Octopath wasn’t no.1 next week. The hell kind of charts are you looking at? Had one of the highest series openings in Japan. 15k debut week in Spain(that puts it only below Mario and Rabbids, Splatoon 2, Breath of the Wild, and Odyssey. All Multi Million Sellers). It’s lirerally showing legs in the country this thread is mostly about? France and Germany should be fine since those are your two biggest Switch European markets. US has signs pointing to a great debut as well. All signs point to Aces being one of the best selling in the series lifetime or the best selling game in the series lifetime. I did actually misread the charts in this thread. Taking back the Mario Tennis takes. But not the other sales takes I've had. Very probably, it won't be No.1 on All formats charts. Crash is too strong on both consoles plus PS4 version keeps selling. Individual charts can be different. 10k would probably get it first place in the individual charts. Glad it sells so well and amazing legs for GOW, Sony is on another world this generation! Yes, some users were using the early UK numbers to assume it bombed WW. Wow, I missed that too. Great news for Crash. Think it's on sale on PSN for $20 this week too. Will probably top the charts for July. It's weird though the only GTA I haven't bought. Can Crash hold another week at the top? Mario Tennis has some great sales in Spain. Damn. Also good second week for Crash. Fifa and GTA are still going. 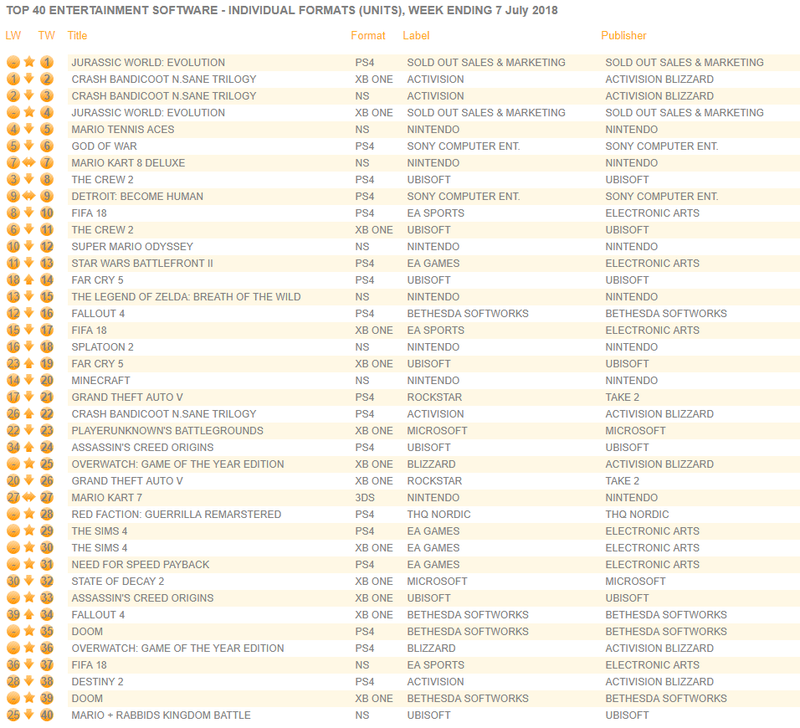 So double Bravely Default and Second, and comes in first in single SKUs and revenue, didn't expect Octopath to do so well in UK! And wow at the Captain Toad split. Octopath Traveler (not including digital sales) must have generated around 2.5 times more revenue than Bravely Default. It is hard to give a more precise estimate because I have no idea about the split between the regular sku and the Compendium Edition. Thanks for pointing that out! I just preordered it, and if I don't want it I can just as easily cancel if I want to. I'd much prefer the Pikachu version instead, though not enough to spend another £15 for mostly the same content. Octopath Traveler (not including digital sales) generated 3 times more revenue than Bravely Default. I don't have a point of reference for BD but that does sound good. The game's been high on Amazon's charts for at least a week now, I can see it doing very well. You might have chosen the worst time to say that, this week's numbers should appear in the next half hour.